diverse experience and methodological approach. Since 2009, we have forged close relationships with over 100 brands allowing us to gain a wide experience marketing vastly different product types and services from various industries, locally, regionally and globally. myCk is a local heartland department store that brings daily household products and apparel to families. They recognized the importance of social media and enlisted Clickr Media to create, manage and provide content for their Facebook page. We helped grow the Facebook fan base from 0 to 4,926 (accurate as at 13 Apr 2017) over the course of 6 months. To plan for content to engage the audience, we first crafted personas before delving into demographics, traits, and interests. Traits like family-oriented or traditional allowed us to resonate with their values, while their interests allowed us to present content in a context that was relevant to them. Digital marketing is a part of the overall marketing plan. We ran in-store promotions to drive page likes offering 10% off selected brands when customers showed that they liked the page at the checkout. We also ran creative contests which were very successful in gaining new fans. In the 6 months that we ran the page, we managed to gain over 4,900 fans; a number that exceeded our initial estimates. We met myCK every month to present monthly reports on the Facebook campaign performance, and give recommendations on content and how to increase their fan base. The meetings produced contests and optimization strategies that directly contributed to growth spikes for the page. Through this experience we gained some new insight on how simplicity of a contest post can garner much more page likes than contests that require more work. The Singapore Jazz Festival (SingJazz) is one of the most anticipated annual events in Singapore, but organisers were not going to bank on the loyal support of the Jazz fans without any marketing activities, especially when SingJazz was going to take place on the same weekend as the much raved about Coldplay concert. Clickr worked closely with the SingJazz organisers to build awareness on the music festival. We studied the customer journey and sales funnel to understand the path to purchasing tickets for the festival. To reach people in the top funnel, who are in the “Awareness” and “Consideration” phase, we chose the display network, YouTube and Facebook as the online media platform. Facebook and YouTube allow us to have specific audience targeting, whereas the display network gives the campaign a wide reach to the audience. Using a wide variety of keywords on the search engine helped us to reach people at various points of the customer journey and sales funnel. The campaign achieved its objective of creating brand awareness online, and exceeded expectations by 22%! If you have read our earlier timeline post for Musee Platinum (it’s about 2 scrolls down), you would have read about our strategy to generate leads for them. Generating leads is not only about targeting the right audience, but also maximising the budget effectiveness. After users reach Musee Platinum’s original landing page, they are redirected to another page to fill in a web form as part of the lead generation process. Clickr hypothesised that the additional step that leads users away from the original landing page could be affecting the conversion rate. We did A/B testing for a landing page and in the variant has a pop-up lightbox web form instead of redirecting users to another page. After gathering enough data over a period of time, we found that the the variant had 371% more conversions than the original landing page. Of course, the optimisation doesn’t end there and we are conducting A/B testing on other hypotheses to continuously improve on the digital marketing campaign. 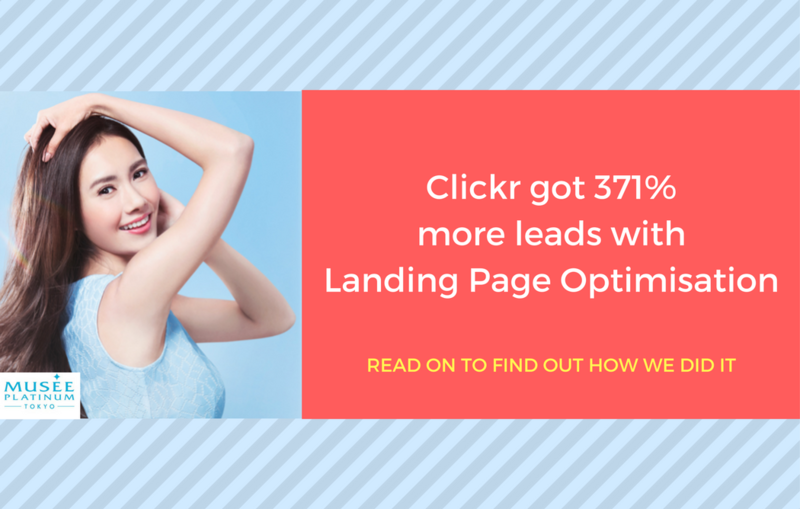 If you’re interested in optimising your landing page for leads to get some tips, read this article. Remember to click on the blue “Subscribe” button to subscribe to our e-newsletter and get free digital marketing tips every week! We helped JIA build a brand new website to improve their web presence and stand out against their competitors online. JIA is a quantity surveyor and project management company in Singapore. They have an extensive portfolio of project listings and our web design had to be in an organised structure to showcase their portfolio. We met up with JIA several times to understand their needs and also advised them on how to improve the content and visuals of their website. Images create an impression with the end-user and also build visual elements of the site. Working with JIA has been an absolute pleasure. Despite facing challenges with obtaining high-quality images, we created an organised layout that provides a constant and smooth page flow. We also manage to include a variety of good images on their website without compromising the quality. During the project phase, we provided constant updates to JIA regarding progress of the website. By the end of the project, we solved the issues JIA were facing, and met their expectations by delivering a brand new corporate website that is modern, stylish and mobile responsive. Estée Lauder is an established beauty brand. They have enjoyed strong support from their customers, who have matured with them over the years. When the brand was ready to grow their customer base with a younger audience, they approached us to help with their Facebook campaign. We began by analysing the types of posts that Estée Lauder had on their Facebook page and found their posts were mainly ads and promotional. To attract a younger audience and appeal to the millennial group, our strategy was first to have more creative visuals and conversational copies in our posts. Clickr provided consultation for creativity and relevancy of the Facebook content to boost engagement rate. We also made targeting options more specific to achieve clear objectives (acquisition, conversion and engagement). Ads were staggered across various segments and objectives to prevent brand fatigue. We also moderated the post and ad frequency to improve budget efficiency and allocated budget for promoting posts to get more reach. Our campaign strategy and management were rewarded with a surge in fan growth of their new audience segment by 4.7% within 4 months. Products Sold Out In 2nd Month Of Campaign – Digital Marketing Success! When Anothersole approached us to help them in digital marketing, its social media pages were brand new, and its e-commerce website was incomplete. Clickr helped Anothersole launch its brand, increase brand awareness and engagement online. We achieved overall increase in sales by 50%, and Anothersole’s shoes were sold out in the 2nd month. The ads performance far exceeded expectations. Conversion rate increased by 3.9%, and cost-per-click (CPC) steadily decreased due to high quality score; this increased the budget efficiency, allowing us to acquire more traffic. On social media, the fan base grew by 56.6% in 2 months. Clickr sourced and liaised with the influencers for this campaign. We started with having influencers post teasers at pre-launch to hype up the anticipation. Phase 1 was to give style pioneers recognition with #FirstToWear cards included in their purchase. Part of our content strategy was to have specific personalities given to each shoe collection. We used very conversational messages to engage our customers. Our primary marketing message focus was aesthetics and lifestyle; we created blog content to emulate lifestyle and give relevant lifestyle advice. The secondary focus was on quality and Buy1Feed1 social cause. The strong trust and communication between Anothersole and us made it easier to achieve results beyond expectation. Clickr was on a mission to generate leads for Musee Platinum Tokyo, by getting customers to sign up for a free consultation. The beauty industry is highly competitive in Singapore’s digital marketing scene. To stay ahead of the competition, our client was offering packages at attractive rates, as well as free consultation. Our job was to ensure that the promotion reaches their target audience at various points of the customer journey, to create awareness and to generate leads. To maximise reach online, we used a variety of ad formats across multiple digital platforms. As part of our strategy to increase conversions, digital ads were also remarketed to users who have visited the Musee Platinum Tokyo’s website, reminding users that they have expressed interest our client’s services before. We also targeted users with a higher intention to purchase on the search engine. Our campaign optimisation effort to push the promotion has enticed many relevant users to sign up with our client. Louken Group is a leading brand growth and communication agency. This project was especially exciting for us because they are our parent company. Louken Group wanted a stylish and dynamic website that can help them further build their online presence. Despite being a B2B business, Louken Group understands that their website needs to be mobile responsive because there are clients who work on the go, and use their mobile device to browse the website. The challenge we faced while planning the website is to simplify complex information to web consumable content and layout, and also to be able to design a layout for a large number of clients and portfolios. We worked closely with our parent company to understand their needs and clients’ needs, for example, the type of information clients need to know before making an enquiry. With a deeper understanding, we were able to revamp the website that meets their objectives.